… if you’re a locust, that is. When the droughts make times tough for the normally solitary little critters, they get packed close together, and a sort of insect mob law takes over in response to a flood of serotonin – swarm time! This change to a more risky social lifestyle demands more brain power from the individual locusts, and their brains expand to cope. Immediate parallels thrown up by my own brain: Teilhard de Chardin’s noosphere; Clarke’s Childhood’s End. Putting on an uncritically optimistic technophiliac hat for a moment, might we imagine the increased global socialisation enabled by modern communications networks to provoke some similar expansion of human brain capacity? We might… but bear in mind the locust’s brain-boost is necessary to cope with a life where fierce resource competition and cannibalism is the norm. Hey presto: a grimly allegorical sf dystopia that writes itself! I’ve been invited to join a panel on robotics at the upcoming Orycon Science Fiction Convention, so I decided to write about them here, too. I also have a story coming out soon in Analog, called “The Robots’ Girl,” which started when I read an article complaining about robots being developed to help with childcare in Japan. 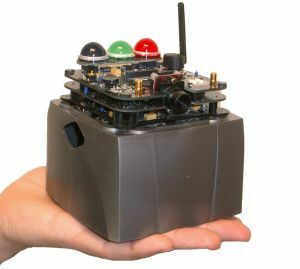 The technique involves integrating an entire robot – with communication, locomotion, energy storage, and electronics – in different modules on a single circuit board. 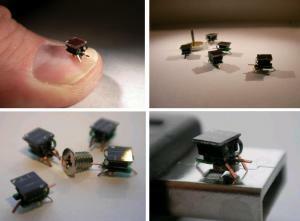 In the past, the single-chip robot concept has presented significant limitations in design and manufacturing. However, instead of using solder to mount electrical components on a printed circuit board as in the conventional method, the researchers use conductive adhesive to attach the components to a double-sided flexible printed circuit board using surface mount technology. The circuit board is then folded to create a three-dimensional robot. I can imagine that once this sort of technology matures it will herald a profound change for society. An Orwellian Panopticon where everyone and everything is traced and followed and tracked will become a practicable possibility. Privacy will become one of the most valuable commodities on the planet, with the richest and most powerful people cowering in enclaves sterilized against micro-invaders. : In that I enjoy them as part of a story and am not entirely ambivalent to their actuality. No, it’s not the title of a new YA science fiction novel. James McLurkin is a researcher at the MIT Computer Science and Artificial Intelligence Lab, which has to be one of the most awesome jobs I can think of. He’s interested in swarm robots (which we’ve mentioned here on Futurismic before, sometimes in a military context), and believes that the future of robotic development is modular, because it allows researchers to design and develop complex robots quickly and cheaply. Chris Kiick of Hack-a-Day went to see a demonstration of McLurkin’s swarm robots, of which I am quite jealous. Apparently McLurkin has over a hundred of these things, though he only takes about a dozen out for shows to do tricks like “circle-the-wagons” and physical bubble-sorts. Even so, my inner geek suspects it’d still whip the hell out of a night at the comedy club. You can find out more about McLurkin’s research at his own MIT website; there’s plenty of video of his swarm in action, also.